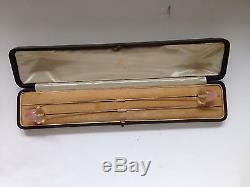 A stunning cased pair of very large domed Rose Quartz and facetted Crystal finial Hatpins circa 1910 retailed byJ. Vickery of Regent Street, London. These are rare - very rare. 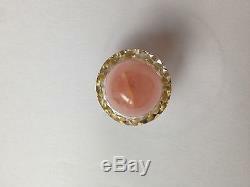 The domed rose quartz heads are 2 cms talland wide. They sit on a facetted crystal rim finial which is 3 cms wide and 1cm deep. The metal shafts are 28 cms long and ingood condition. 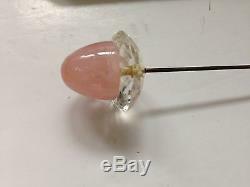 There is no damage to the rose quartz orcrystal finials. A really superb set in their originalfitted case. Happy to post internationally AT COST. 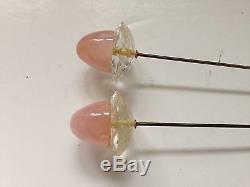 The item "A fabulous boxed pair of Rose Quartz & Crystal Hatpins" is in sale since Sunday, February 11, 2018. 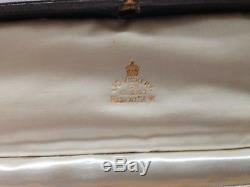 This item is in the category "Collectables\Vanity, Perfume & Grooming\Hatpins". The seller is "capmajor" and is located in Newmarket. This item can be shipped worldwide.